There is new technology news for you that a Taiwan based company named Gigabyte announced a new ultra book the name of this ultra book is U 2442. 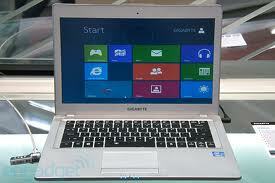 Anyhow if we look at this ultra book it looks just like a laptop its specifications are like laptop. This laptop is solid and very good for users also it is a thin ultra book and it is qualified by the Intel as an ultra book It is powered by the 3rd generation processors of Intel core. There are some other good features in this laptop that it has a 14 inches screen in High Definition also with a led back light display it also has a resolution of 1600 x 900 pixel. It can run both of the versions of window 7, basic or professional and also runs the window 8. It also has a 2.5 gega Hz processor in it. The interior space begins at 4 Gega Byte with 8 Gega Byte up to 16 Gega Byte of DDRIII in two slots. It also has two fast connecting USB ports. It also has a 1.3 mega pixel web camera in it. It weights 1.59 kilo gram. If you want information about the other technology devices then keep visiting our site.